Designed for PRO Audio and Commercial applications, the LAP-AS Networked linked Audio processors are the first products to combine secured networking and PRO-sound requirements. Sonic excellenceThe advanced 24 bits A/D and D/A convertors, together with the 96 kHz-capable audio processing and the 400 mHz SIMD SHARC core, capable of 2.4 GFLOPS peak performance, guarantee an excellent sound quality and low latency. Impressive array of signal processing toolsThe LAP-AS are comprehensive systems which integrate pre-amplifier, compressor-limiter, equalizer, as well as matrixing and delay functions into one unit. Useful features like Automatic Gain Control, Feedback killers, Automatic Microphone mixers and Crossovers are also part of the LAP-AS DSP components library.This new generation provides a message storage component able to store several audio message in the LAP-AS that can play 2 messages at the same time and store up to 53 minutes of text/music. (Is not available in 96 kHz mode). The following events: Play a message, change master preset, sub preset, element adjustment or set the TTL out can be controlled by third party protocol, by control inputs or by the scheduler. The scheduler can lead all the events described above. Internal processing of audio signals can be fully programmed to suit the client’s application.Installers can select the audio processing feature(s) which they wish to apply to the various inputs and outputs from a library on their PC, using software provided with the LAP-AS. Once the configuration process is completed, it can be loaded into the LAP-AS. All configurations can be backed-up onto PC and loaded into the LAP-AS as and when required. Advanced Preset managerThe LAP-AS includes two types of presets:- More than 20 Parameter presets: they enable values of multiple parameters of the same design, such as levels, gains, EQ, etc. to be restored either from the PC software, the remote controllers or the control inputs.- Up to 32 design presets: they enable completely different designs to be restored. An application example for this feature is hotel meeting rooms with removable walls. Furthermore, LAP-AS now provides a TCP/IP port with RJ45 connector. PC-based custom control panels can now operate the LAP-AS from remote locations through a TCP/IP network. 16 Analogue or logic control inputsThe LAP-AS has 16 control inputs which can be configured as analog control input (0 to 5 VDC or as logic input (TTL) Each analog control can be associated to any of the variable audio processing functions of the LAP-AS (input level, output level, equalization, routing). Several parameters (Min + Max values, positive or negative variation, linear, log, anti-log) can be programmed for each of those controls. The logic inputs could be use to mute or activate an audio signal. The logic inputs can be used in normal or binary mode. 8 Logic outputs (GPIOs)Each LAP-AS is equipped with 8 relay outputs. Each of that hardware output’s can be associated to virtually any software button the system designer requires to. The logic outputs enable the LAP-AS to control external equipment. RS-232 serial interfacing for third party controlThe LAP-AS's can be controlled from third party equipment like Vity, AMX or Crestron via its RS232 serial port. CAT5 and fiber optic redundant audio networking capabilitiesATEÏS has developed its own audio networking system ’’Ateïs-Net Secured Audio Network’’. 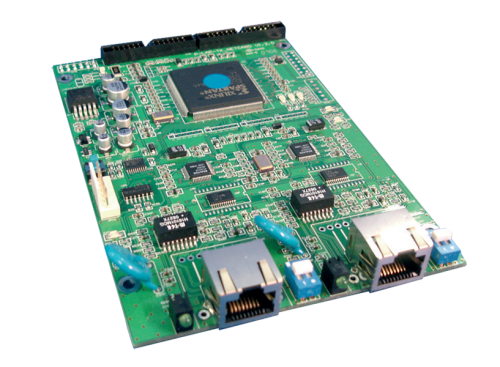 This Ethernet based network is able to simultaneously transport 48 audio channels (32 bits, 48 KHz sampling rate) with a latency < 1msec together with the necessary control data.For decentralized or big applications, an optional networking card can be inserted inside the LAP-AS's. 8 Logic outputs (GPIOs)Each LAP-ASis equipped with 8 relay outputs. Each of that hardware output’s can be associated to virtually any software button the system designer requires to. The logic outputs enable the LAPG2 to control external equipment.RS-232 serial interfacing for third party controlThe LAP-AS can be controlled from third party equipment like Vity, AMX or Crestron via its RS232 serial port. CAT5 and fiber optic redundant audio networking capabilitiesATEÏS has developed its own audio networking system ’’Ateïs-Net Secured Audio Network’’. 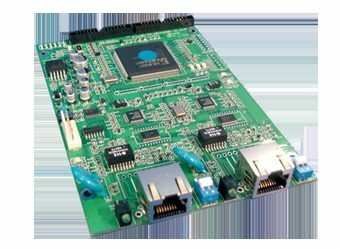 This Ethernet based network is able to simultaneously transport 48 audio channels (32 bits, 48 KHz sampling rate) with a latency < 1msec together with the necessary control data.For decentralized or big applications, an optional networking card can be inserted inside the LAP-AS's. Thanks to its loop architecture, the Ateïs-Net Secured Audio Network audio network is fully redundant. If a problem (Line open or shorted) occurs on a loop segment, it will be automatically isolated without affecting the system functionalities. Up to 32 LAP-AS's can be connected together on the same network. As the Network addresses are auto-negotiated, the network set up is very easy. Once programmed, the system will be able to work independently (off-line) without the PC.